Register today at the Heart + Hand Outreach Ministries Facebook page or stop by to preregiser. Create a team, get sponsors, walk the map with us through downtown South Charleston. You (and your dog) can help feed the need! Heart & Hand helps 5,000 individuals yearly with food and other basic needs. This annual event brings the community together to help our neighbors. 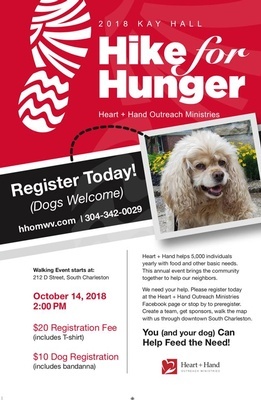 Register online at Heart + Hand Outreach Ministries Facebook Page or stop by Heart + Hand to preregister.